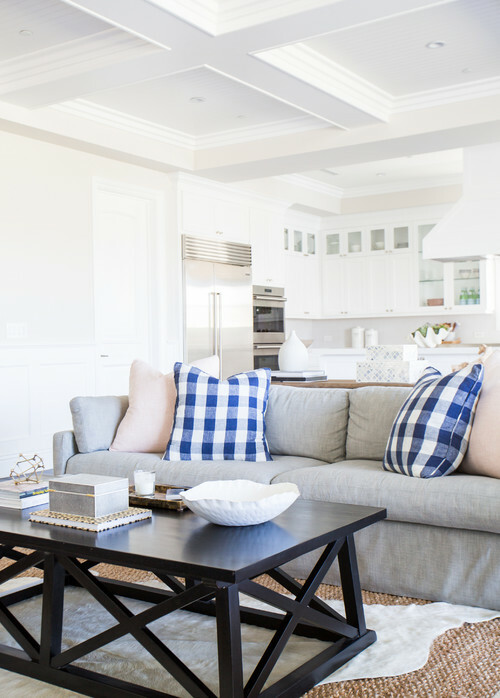 Today’s home tour is a bit of contemporary style mixed with coastal elements. Soft colors pair with hints of gold and the occasional bold color. The resulting look is fresh and appealing. 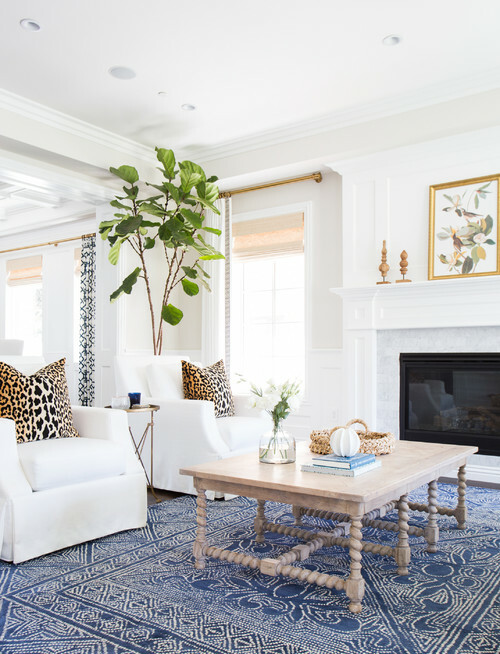 Designed by husband and wife team of Studio McGee, I think you’ll thoroughly enjoy today’s Pacific coastal style home tour! 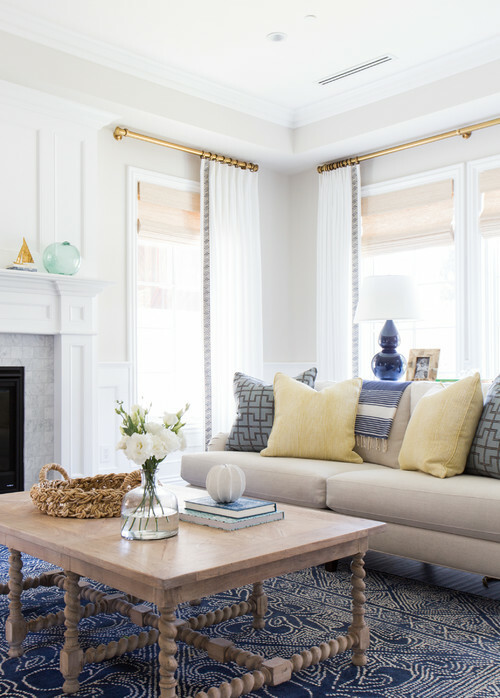 The living room is soft and relaxed with simple window treatments and a playful patterned rug. Note the turned legs on the coffee table in a hue reminiscent of driftwood. The other half of the living room sports animal print pillows and a stately fig leaf tree. 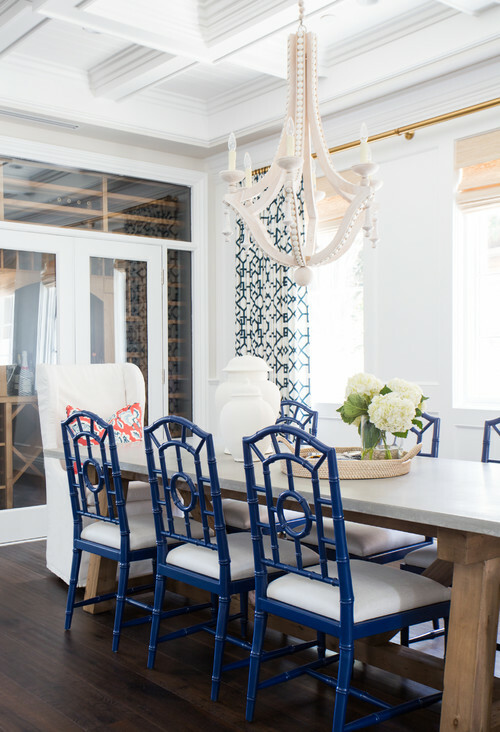 The dining room features a beautiful wooden chandelier with oriental-style chairs in a bold blue. I believe the room behind the glass doors is a wine cellar. Gorgeous details are seen throughout today’s Pacific coastal style home, like the architectural ceiling seen here. Beautiful furniture pieces are evident throughout, like the sofa table in the family room. I love the appearance of the slightly weathered wood. Darker wood pieces keep the living spaces from looking too light. The family room conveniently opens up to the kitchen. And what a beautiful kitchen it is! The island is large enough to accommodate the entire family for breakfast or a quick lunch. 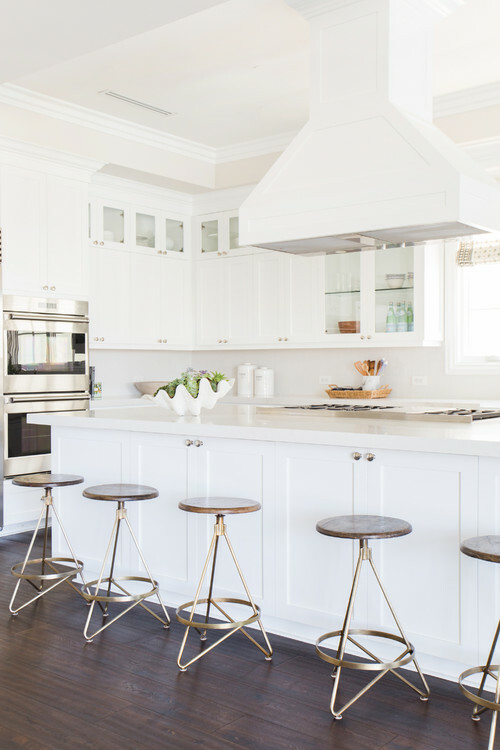 In the kitchen, dark wood floors are paired with white cabinets and counter tops. I love the look of dark wood and white together. 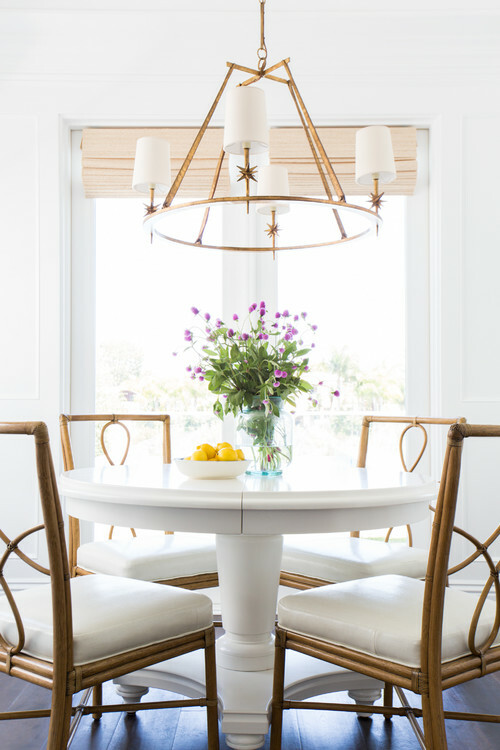 The nearby breakfast nook incorporates a whimsical chandelier and chairs. Plenty of windows keep the rooms light and bright. 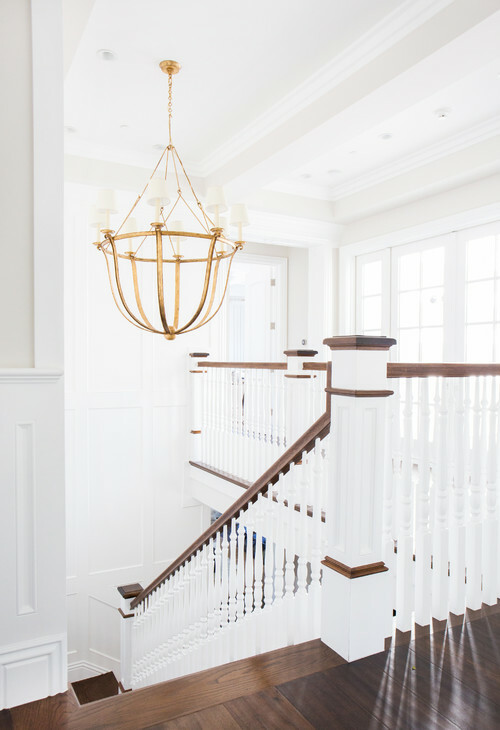 The stairway reveals more dark wood paired with white … along with a gold chandelier to add a bit of bling. Bedrooms are uncluttered and comfortable. Simple shades are all that’s needed on the windows. 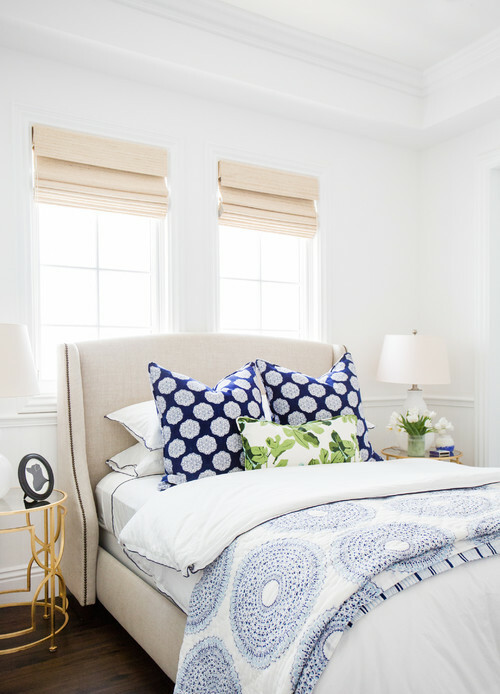 Bedding in soft tones create a relaxed and peaceful space – with a hint of green for fun. The girl’s bedroom is charming in soft pink with accents of blue and yellow. And of course, a home this beautiful needs an amazing bathroom! Forget the shower – I think I’d prefer to soak in this tub! You can see more photos of this stunning Pacific coastal style home over at Houzz. Beautiful home! So many details that I love…the dark floors, the lighting, the rugs (especially the living room rug), the sofa table…lots to delight the senses. Lighting,rugs,floors and lovely staircase, i enjoyed it all, thanks. Beautiful home Jennifer! Thank you for sharing!! !